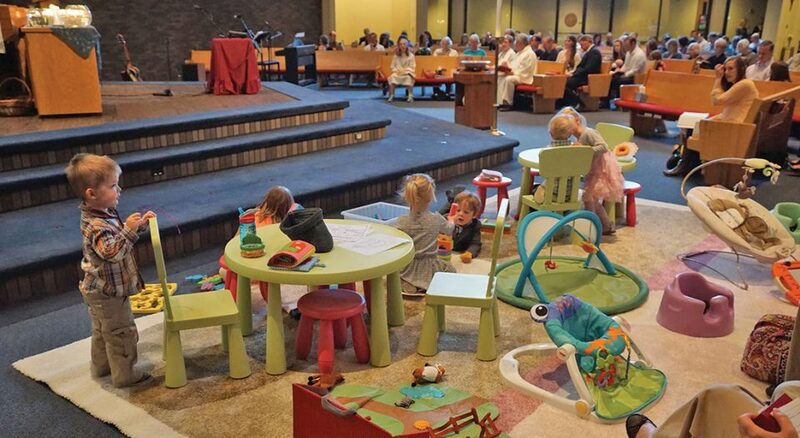 Instead of wrestling with their parents in the back pews during worship, toddlers at Grace Lutheran Church, Apple Valley, Minn., sit up front in the sanctuary. They’re stationed a few feet from the pulpit in their own space, the Pray-Ground. 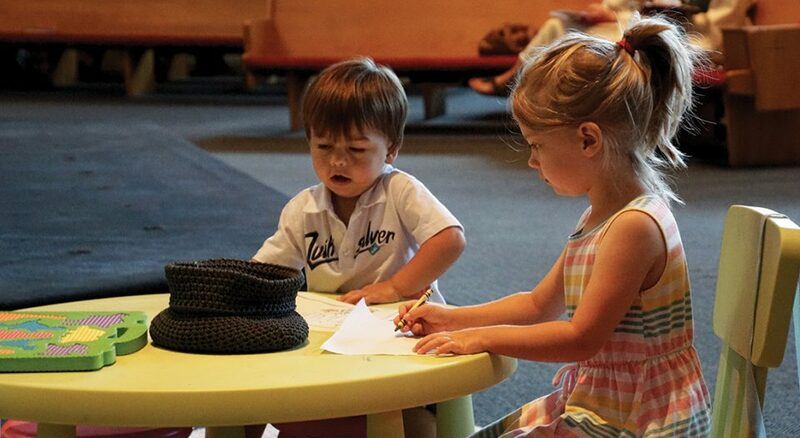 Complete with itty-bitty chairs and tables, coloring supplies and soft toys, the spot is perfect for pint-sized parishioners and their parents, who report they can better engage in the service. This May marks the third anniversary of Grace’s Pray-Ground. 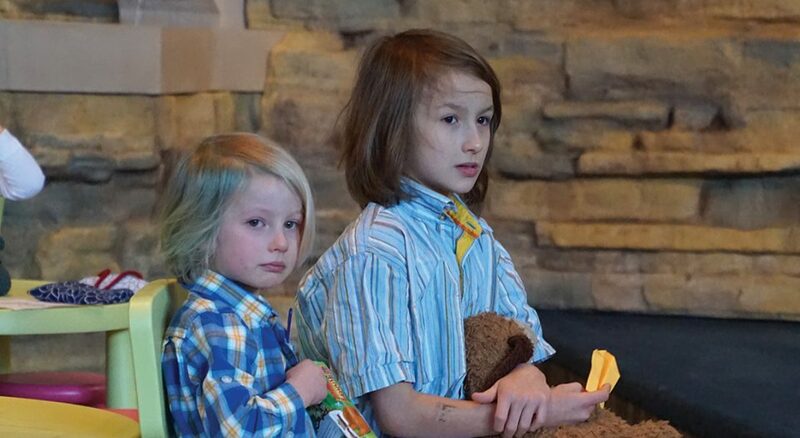 Designed for children ages 3 and under, it has transformed children’s ministry at Grace—and beyond. Andrea Roske-Metcalfe, a pastor of Grace, introduced the Pray-Ground to the congregation on Mother’s Day 2015. To make room for it, two rows of pews were moved; then furniture, rugs and toys were added. She estimates the congregation spent about $1,500 on the changes. Roske-Metcalfe’s experience as a mother inspired the venture. While visiting another church, she noticed plaques on the back pews indicating they were reserved for families with small children. “I’m 100 percent positive [the church] meant this as a gesture of hospitality, especially for parents who want to have a quick exit. But that day, as a parent of small children, it made me feel the opposite of welcome,” she said. Since Grace understands itself to be a welcoming congregation, Roske-Metcalfe said members are constantly examining their practices. In her experience, children often pay more attention in worship when they can see what’s going on. 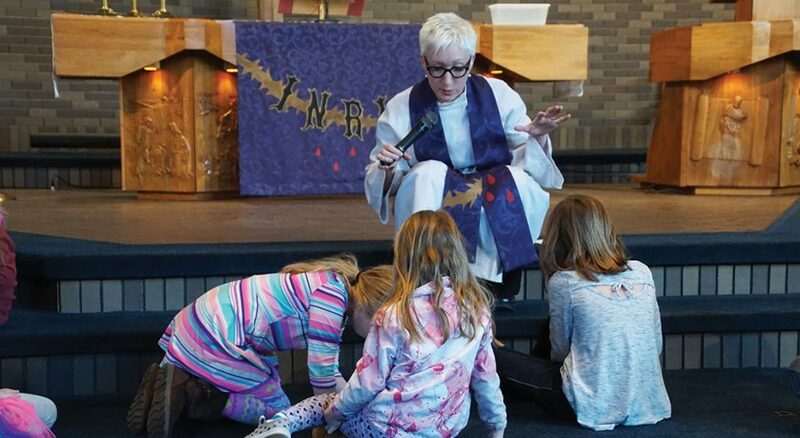 “I was thinking about the actual locations of kids in worship in relation to where the action is, and [the Pray-Ground] is where that thinking ended up,” she added. Joanne Wevley, a member of Grace since 1968, was surprised the first time she saw the Pray-Ground. She thought it would be a disaster, but she quickly changed her mind when she saw the children weren’t disruptive and enjoyed it. “It’s unbelievable how good it works,” she said. The ministry even attracted new families to Grace, like Danielle (last name withheld) and her 5-year-old daughter and 3-year-old son. Danielle recalled a service they attended at another church where her daughter kept singing after the hymn had ended. She was later told the church had a nursery. The comment made her feel as if her children didn’t belong in the pews—and she didn’t want to be there either. Danielle found that in the Pray-Ground. “I love it,” she said. A year after the Pray-Ground was launched, Roske-Metcalfe shared photos of it on Grace’s Facebook page to show its influence on the 1,800-member congregation. To her surprise, the Facebook album went viral, bringing thousands of comments from curious churchgoers. While Grace may not be the first congregation to come up with this ministry, Roske-Metcalfe said the photos helped spread the idea. First Presbyterian Church of Hays, Kan., opened its Pray-Ground in September 2016. The multigenerational congregation has around 120 members, with many over age 80. “Even though we were real careful where we placed the Pray-Ground, it took us a while,” said Becky Rogowski, First’s coordinator of faith development. The choir loft is in the front right corner of the sanctuary, and its microphones picked up sounds from the Pray-Ground, which affected hearing aid monitors, she said. Adjustments were made and, overall, their Pray-Ground has been well received, Rogowski said. By taking it slow, the congregation has made progress, she added, and is now prepared for young families. Faith Presbyterian Church in Greensboro, N.C., is going on four years with its Pray-Ground. Between five and eight children use it each Sunday, said Karen Ware Jackson, one of its pastors. “It took some time and consistent effort on the part of the congregation to bear with the noise and distraction, and it also took a consistent message from me,” she said. Back at Grace, Roske-Metcalfe knows of no one who has left the congregation because of the Pray-Ground. She’s heard a few negative comments from some who have concerns about disrespect for God’s word. Yet she believes the overwhelming response is positive. Roske-Metcalfe said she’s aware of some congregations where a Pray-Ground wasn’t given enough time or a pastor didn’t support it. In some places it failed because a congregation didn’t have options to offer with it, such as a nursery, she said. “I have yet to be convinced that it can’t be implemented at least in some form or fashion in just about every worshiping community,” Roske-Metcalfe said. The Pray-Ground’s impact can be seen in children of all ages. “It’s nice to know the kids are important, that they can be part of the entire service,” said Corrie Walden, whose 4-year-old son, Ender, loves playing with blocks in Grace’s Pray-Ground. One Sunday when her son, Nat, now 9, was in the Pray-Ground, he grabbed a small chair and pulled it close to the steps leading to the altar. He sat listening to the sermon as if he had a front-row seat, she said. Michael Olivier, father of 4-year-old Ingrid, said she “managed to soak up a good chunk of the Lord’s Prayer.” He was surprised one day when she showed him she had learned most of the words. Mensing is a writer and ELCA member based in Minnesota and the Dakotas.